Starting on September 9th, 2001, we follow the life of several young teens. Sergio has traveled from New York to the University of Chicago to be honored for a high score on a math test. He misses his grandmother, who is raising him, and is trying to distance himself from his father. Nadira is from Columbus, Ohio, but her parents are Muslims from Iran. She wears a hijab, and gets some grief for it at school. Aimee's mother is a high powered business woman who travels to New York City for a big meeting, and Aimee is starting a new school because of her mother's new job. Will and his family have traveled to Disney World, a trip paid for by people in his hometown after his father's death in a car accident. 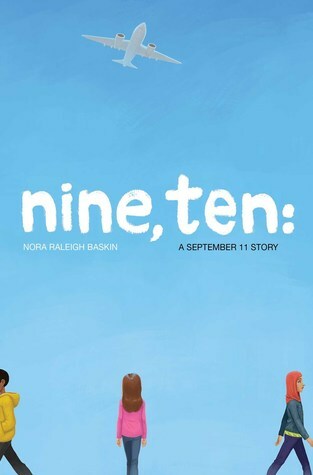 We get a good glimpse of what life is like for the children, and then see what happens to them on 9/11 and after. None are directly impacted, but the event nonetheless changes all of their lives. Strengths: Baskin tells a bit about how and why she wrote this book in an epilogue, and I can see why she chose to tell about life right before the World Trade Center disaster. It is interesting that we meet all of the characters in an airport on the Sunday before-- I was actually in the Columbus airport that day, picking up a friend. I can remember very clearly that the security guard waved me around the gates with a stroller. That would never happen now. Most readers will be more interested in the events of 9/11 itself. Weaknesses: Four stories was a lot to keep straight, especially since they were not simple ones. I would have preferred two characters, perhaps Aimee and Nadira. Having more doesn't ruin the book, but it does make it harder to follow. What I really think: I will probably buy this, since our teachers assign a project on this event every year. Since middle school students were now all born after 2001, they often lack the most basic knowledge of the event. Since the book covers mostly events before the attacks (as mentioned above), this will not be as helpful for the students' projects as other novels about 9/11, but they will still gain some insight on what life was like before they were born. Dear Kirby, Thank you for commenting. I think that you misunderstood my original "what I really think" comment, so I have changed it to make it more clear. As I have commented on my blog many times, while I personally am an enormous fan of historical fiction, it is very difficult to get my students to read. This saddens me, since I agree with your comments that it is good for them to read about the past. Some historical books are more successful with my students than others, and I felt that this particular book does take a more mature reader. It is a bit longer, has multiple viewpoints, and isn't as immediately compelling as something like the Lauren Tarshis "I Survived" books, which ARE popular with my students. I am sorry for any misunderstanding, and glad to know that authors are passionate about their genres!